Researchers at the Massachusetts Institute of Technology in Cambridge, Massachusetts (US) have developed a sensor that can be implanted in the brain without requiring power or a wired connection into the brain. The device, which can detect tiny electrical currents in the brain and optical signals produced by luminescent proteins, interacts with an MRI scanner outside the body. 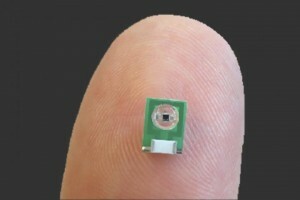 Not requiring a wire or battery are not the only advantages of the new MRI sensor: “Our device interacts with an MRI scanner by changing the MRI signal close by and can use the unique three-dimensional capabilities of MRI to give us a volumetric information from the brain, a technique that is sorely needed in neuroscience and neurology,” Hai says. To create the sensor, Hai and his colleagues minimized a radio antenna down to just a few millimeters, tiny enough to be implanted directly into the brain. The MRI scanner outside the body detects the radio waves generated by water in the brain tissue. Initially, the MRI sensor in the brain is tuned to the same frequency as the radio waves emitted by the hydrogen atoms. When the sensor picks up an electromagnetic signal, its tuning changes and the sensor no longer matches the frequency of the hydrogen atoms. The external MRI scanner can pick up on this change, and the MIT scientists were able to show that their devices are sensitive to biological-scale potentials on the order of millivolts, comparable to what biological tissue generates, especially in the brain. “We can make smaller and more flexible versions of the device, which means that we will be able to inject them in large numbers without major surgery and get large-scale information from the entire volume of the brain,” says Hai. Hai is also the lead author of the study “Wireless resonant circuits for the minimally invasive sensing of biophysical processes in magnetic resonance imaging,” published in Nature Biomedical Engineering.